Abstract - In an effort to ease the burden of programming motor commands for humanoid robots, a computer vision technique is developed for converting a monocular video sequence of human gestures into robot motor commands for the HOAP2 humanoid robot. The human teacher wears colored clothing of known dimensions while performing the desired gestures. Leveraging the colors of the clothes, the system detects the most probable locations of the different body parts and joints in the image. Then, by exploiting the approximate dimensions of the shirt, a user specified number of 2D poses are generated for each frame. Each 2D pose is then used to generate all possible 3D poses given the known lengths of each body part. The 3D poses are then converted into corresponding robot motor commands and the poses which contain illegal motor commands are removed. Finally, a forward Viterbi search is used to chose which 3D pose to send to the robot for each frame of the video. The implementation of this system was written using C++ and the program is currently capable of processing data sequences in real-time using a distributed algorithm and a 30 node cluster of linux processors. Teaching complex motor behavior to a robot can be extremely tedious and time consuming. Often, a programmer will have to spend days deciding on exact motor control sequences for every joint in the robot for a gesture that only lasts a few seconds. A much more intuitive approach would be to teach a robot how to generate its own motor commands for gestures by simply watching an instructor perform the desired task. In other words, the robot should learn to translate the perceived pose of its instructor into appropriate motor commands for itself. This imitation learning paradigm is intuitive because it is exactly how we humans learn to control our bodies. Even at very young ages, we learn to control our bodies and perform tasks by watching others perform those tasks. But the first hurdle in this imitation learning task is one of image processing. The challenge is to develop accurate methods of extracting 3D human poses from monocular 2D images. 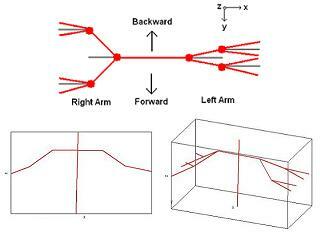 Currently, the most common method for training robots complex motions is to use a motion capture system. Here at the UW Computer Science department, we have a full motion capture rig which is capable of extracting the exact locations of targets in a 3D environment. So to get a sequence of 3-dimensional body poses, an instructor dawns a special suit with targets on each of its joints, and then performs the desired gesture while the motion capture system records. This technique works quite well because there are sensors all around the room, and thus accurate joint locations of the actor can be extracted using triangulation techniques. The biggest downside to using a motion capture rig is that training can only be performed in a rigid (and expensive) environment. Also, the motion capture system is unsatisfying because it does not allow the robot to behave autonomously. It is much more desirable for the robot to use its own vision system to extract the 3D gesture of its instructor. This would allow us to "close the loop" for the learning process. Using only its own eyes, a robot should be able to watch an instructor, convert what it sees into a 3D gesture, and then translate that gesture into its own motor command sequences. In an effort to improve on the motion capture method described in the previous section, I have developed a new system for detecting human poses using only a single camera and a calibrated shirt and pants. The method uses a nonparametric probabilistic frame work for localizing human body parts and joints in 2D images, converting those joints into possible 3D locations, extracting the most likely 3D pose, and then converting that pose into the equivalent motor commands for our HOAP2 humanoid robot. A step by step explanation of the pose estimation algorithm is shown below along with videos to demonstrate the intermediary results of each stage of the processing. Of course, the first step is for a human to perform the desired gesture while wearing the colored shirt and pants. The robot watches the complete gesture and saves the video sequence for analysis. Due to the limited distance between the stereo vision system on the HOAP-2 robot, depth information is practically unusable. Thus, we are essentially left with only a monocular video of the gesture. Video showing an example of a gesture performed by a trainer. Next, the system needs to detect where the different body parts are most likely located in each frame of the video sequence. 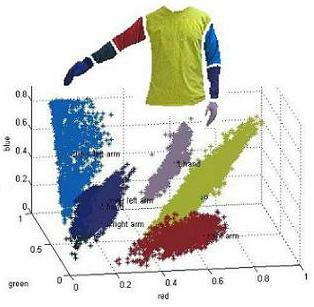 Since we have granted ourselves the concession of using clothing with known colors, body part detection is done by training a classifier in RGB color space. Using a simple GUI, the user hand selects example regions for each of the body parts. The RGB values of the pixels in each region are then fit with Gaussian distributions and the curve fit parameters are saved to a file. Visualization of the RGB space for the body part pixel classifier. Once the colors have been learned for each body part, it is relatively fast and easy to detect the probable body part locations in any other frame from the sequence. For example, Figure 3 shows the probability of each pixel being part of the person�s torso. Part location probability maps can thus be generated for each body part in each frame of the video sequence. Video showing the results of body part detection using the RGB classifier. Once probability maps have been generated for each body part, the system uses that information to generate probability maps for each of the person�s joints. For every pair of body parts that are connected by a joint, the system performs two steps to generate the joint location probability map. First, each body part probability map is spatially blurred with a Gaussian kernel. To speed up processing this blurring is performed in the frequency domain using FFTs. Then, for every pair of body parts that are connected by a joint, the spatially blurred body part maps are multiplied together and the resulting map is normalized so it is a valid probability distribution function (PDF) for the current joint. The resulting maps show the most likely locations for each of the instructors joints in the current 2D video frame. An example of a 2D joint location probability map is shown in figure 4. Video showing the results of joint location estimation using the RGB classifier. The next step the system takes is to randomly sample N different 2D poses from the joint location distributions. The sampling is done with replacement using the PDF of each joint to control the sampling. So that the poses that are generated are a collection of the most likely possible poses. The number of poses sampled is a user controlled variable and is currently set to 100. Figure 6 shows an example of five 2D poses sampled from the joint distributions. Video showing N 2D poses sampled from the joint location estimation maps. Converting the 2D poses into 3D space requires that we exploit the approximate known dimensions of the human body. In this system, all body part lengths are measured with respect to the length of the torso. This helps make the system more robust and allows the trainer to be any distance from the camera. In our model of the human body, the shoulder line is 0.6 times the length of the torso, the upper arms are 0.4 times the length of the torso, and the lower arms are 0.35 times the length of the torso. Converting a given 2D pose into 3D is thus a matter of figuring out how far forward or backwards each joint needs to move in order to make each body part the correct length in 3D space. For example, if the upper left arm is measured to be length Dmeasured in the current 2D pose and the upper left arm is supposed to be length Dtrue in 3D space, then the left elbow could either be forward or backwards the distance Doffset, where Doffset = �sqrt(Dtrue^2 - Dmeasured^2). Visualization of the conversion from a single 2D pose to all possible 3D poses. Converting each of the 3D poses into the corresponding angles for the robot joints is performed using reverse kinematics. The robots upper body has 8 degrees of freedom (ignoring the head and the hands). Starting with the upper left arm, the system detects the amount of forward/backward rotation in degrees, saves that angle, and then rotates all of the left arm joints about the shoulder using the negative of the found angle. This procedure is carried out for each of the degrees of freedom until all of the joints have been rotated back to their initial state. Thus, after finding all the angles required to get the 3D pose to its zero state, we have all the motor commands the robot needs to perform to get to the current 3D pose. Throughout the process of converting each of the 3D poses into robot angles, if an angle is detected that is beyond the limits of the robot�s abilities, then the system immediately aborts the reverse kinematic process and that pose is removed from the list of possible poses. This both saves processing time and greatly reduces the number of 3D poses that are generated for the given frame. After performing all the steps listed above, the system is inevitably left with a fair number of possible poses it could send to the robot. A forward Viterbi search is implemented to decide which of the possible poses to send to the robot for each frame in the video. A number of different gestures where tested using the method described above. Results for these trials are shown in the videos below. Y. D. Anthony Dearden, "Learning forward models for robots," (2005). C. L. Baker, J. B. Tenenbaum, and R. R. Saxe, "Bayesian models of human action understanding," (2005). D. Crandall, P. Felzenszwalb, and D. Huttenlocher, "Spatial priors for part-based recognition using statistical models," (2005). P. Felzenszwalb and D. Huttenlocher, "Efficient belief propagation for early vision," vol. 1, pp. 261-268, 2004. K. Grauman, G. Shakhnarovich, and T. Darrell, "Inferring 3d structure with a statistical image-based shape model," October 2003. X. . D. P. H. Lan, "Beyond trees: Common-factor models for 2d human pose recovery." IEEE ICCV, 2005, pp. 470-477. X. Lan, S. Roth, D. Huttenlocher, and M. J. Black, "Efficient belief propagation with learned higher-order markov random fields," (2006).